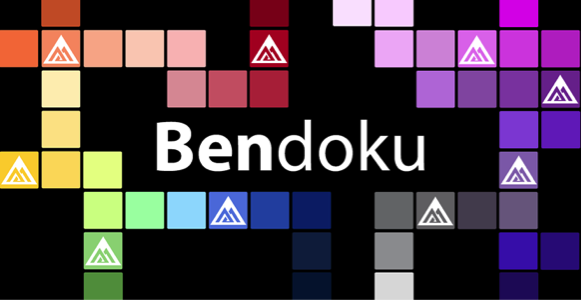 Benjamin Moore is stirring things up, dipping their brush into the game and adding color to interactive marketing game with with Bendoku. The paint company is rolling out Bendoku, an app to somehow help make paint interesting to the technology-ridden millenials. Leave it to a paint company to develop a digital app that’s about as exciting as watching their product dry on a wall. One challenge was originality and let’s just say Benjamin Moore didn’t pass with flying colors. A wise man once said that when in doubt, steal. There was a huge flap recently over some app called Flappy Birds for supposedly copying Nintendo games. Flappy Birds was shut down, until clones started to pop up. The spirit of theft also seems to be the name of the game for the new Benjamin Moore app “Bendoku”, which allows users to mix and match different colors for god knows what reason. Anyway, long story short is that there is an almost identical app called “Blendoku” that basically tests your ability to indentify and mix colors. Bendoku…Blendoku…get it? When you can’t beat em’ I guess you join em’ because the big wigs at Benjamin Moore look like they’re embracing the obvious, uh, inspiration. As chief marketing officer David Melancon said: “People who like playing their game will like playing ours.” A cut and dry clone through and through. It just seems like Benjamin Moore has decided that any press is good press and if they can piggyback onto a more successful digital product, it’s worth the exposure. And that’s nothing to gloss over. Benjamin Moore colors MY world! Aaah, Benjamin Moore Adds Color to Interactive Marketing. I have always thought marketing can do so well if they use colors creatively. I hope this will change few things in line…As a marketing expert yourself Howard Davidson Arlington MA, it was interesting to read your thoughts. They say colors have their own language and Benjamin Moore is just proving it right. Good concept, I hope this turns out good. Well written Howard Davidson Arlington MA. Thank you for sharing this with us.